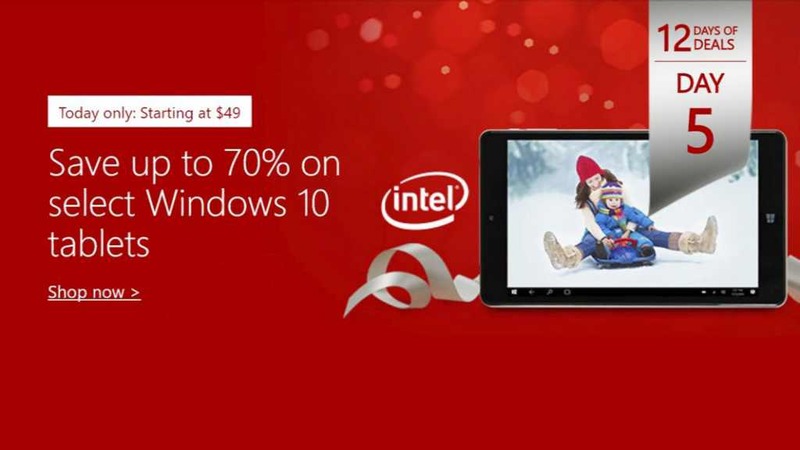 As part of Microsoft Store’s 12 Days of Deals program, you can now get up to 70% off select Windows tablets. Find some of the devices that are available as part of this sale below. NuVision TM800W560L Signature Edition Tablet: 8-inch Full HD touchscreen, Intel Atom Z3735F, 2GB memory/32GB eMMC, Up to 6 hours battery life – Buy this device for $49 here from Microsoft Store. NuVision TM800W610L Signature Edition Tablet: 8-inch Full HD touchscreen,Intel Atom x5-Z8300,n2GB memory/32GB SSD, Up to 6 hours battery life – Buy this device for $59 here from Microsoft Store. NuVision TM800P610L Signature Edition Tablet: – 8-inch Full HD touchscreen, Intel Atom x5-Z8300, 2GB memory/32GB SSD, Up to 6 hours battery life, Windows 10 Pro – Buy this device for $69 here from Microsoft Store. HP x2 Detachable 10-p092ms Signature Edition 2 in 1 PC: 10.1-inch HD touchscreen, Intel Atom x5-Z8350, 2GB memory/32GB eMMC, Up to 9.5 hours battery life – Buy this device for $179 here from Microsoft Store. NuVision Duo 10 TM101W635L Signature Edition 2 in 1 PC – 10.1-inch HD touchscreen, Intel Atom x5-Z8300, 2GB memory/64GB SSD, Includes detachable keyboard and stylus – Buy this device for $199 here from Microsoft Store. Find other deals here from Microsoft Store.